A number of pet owners nationwide say they've been targeted by callers who make big promises to find their lost pets, and the network of Illinois professionals with which the service claims to be affiliated denies any working partnership. The owners of lost pets say they receive calls almost immediately after listing their phone numbers online, on Craigslist or Facebook pages, offering "help" for a fee. Pet owners in the Chicago area say it happened to them, and describe a pitch accompanied by promises of a speedy recovery or a full refund of their money. Several told NBC 5 Investigates that a caller described the services as "free" but then asked for a processing fee anywhere from $60 to $140. "Oh, you don't have to pay me now, we'll just keep your credit card on file and we'll charge you whenever you like," one says she was told. Another said the caller referenced her pet by name and told her he had seen the picture she posted minutes before on the Facebook page of Lost Dogs Illinois. Susan Taney runs Lost Dogs Illinois from her home in Harvard, and says she heard so many complaints about a business called The Pet Rescue, based in Las Vegas, that she posted an alert on the group’s page. "My fear is he’s giving owners of lost dogs a false sense of security," Taney said. "People that lost their dogs? He's just preying on them. And a lot of times people, they'll do anything." 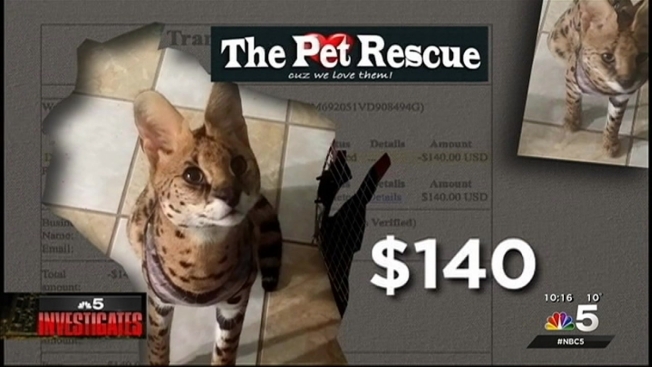 Other lost pet chapters across the country report similar complaints, including a Wisconsin woman who says she paid The Pet Rescue $140 to find her exotic cat, which they promised to have home in 4 days. A month later, she still does not have her cat. The Pet Rescue advertises the largest network of veterinarians, shelters and rescue groups in North America, and boasts a network of 65,000 professionals and volunteers. In a Skype interview, the man who runs The Pet Rescue told NBC 5 Investigates that he has been unfairly targeted in previous media coverage as a thief who preys on pet owners’ pain. Maurizio Comelli, who runs the business from Las Vegas but says he also lives in Brazil and Italy, denies that he or his volunteers pose as representatives of Lost Dog Illinois or other state chapters. "This is worse than insulting," Comelli said. But he had a hard time explaining how the 14 Illinois shelters and nine veterinarians listed on his website had never heard of Comelli or The Pet Rescue. We called all 23 businesses listed, and not one said they had received lost pet information from The Pet Rescue. "Well, they lie," he said. All 23 of them, we asked? In a 30-minute interview, Comelli denied any wrongdoing, and told NBC 5 Investigates he is not in this business for money, but rather for love of pets. He said customers become unhappy with his business when their pets cannot be found. He offered to refund part of the Wisconsin cat owner’s money, and said he would make sure his employees clearly identify themselves as volunteers who never ask for personal or sensitive information. Comelli gave us the names of three customers who confirmed they were satisfied with The Pet Rescue’s services, though one of them told us she was bothered by unrealistic promises made by a company representative who guaranteed “an 80 percent chance” he could have her cat home in days. Eight months later, she said, her cat is still missing.